As baby boomers pass age 50, problems with knees, ankles, and backs are leading them into lower-impact forms of fitness. The stress of career and later-in-life children also have them seeking new ways to relax. Combine these pressures and it is no surprise that yoga is increasing in popularity among the 50-plus crowd. Tailored specifically for this burgeoning population, 50+ Yoga offers a straightforward approach that makes it easy to learn yoga at any age. The book's adaptable program allows readers in good shape to experience a challenging workout, while people with physical limitations benefit from gentler postures, breathing exercises, and meditation practices. Throughout the book, the author focuses on the needs of older beginning students, providing tips for moving comfortably into a pose, avoiding injury, and using helpful props, such as chairs, foam blocks, and cotton straps. The author details the basic principles of yoga and teaches the common elements of all postures and movements: alignment, breath, and awareness. 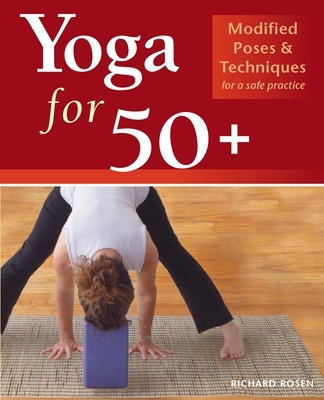 However, the vast majority of the book is devoted to teaching the yoga poses through the use of step-by-step photos, clearly written instructions, and helpful hints from the author. A graduate of the Iyengar Institute of San Francisco, Richard Rosen has been teaching yoga since 1987. He is deputy director of the Yoga Research and Education Center in Santa Rosa, CA, and the senior editor of the center's International Journal of Yoga Therapy. A contributing editor at Yoga Journal and the author of The Yoga of Breath, he lives in Berkeley, CA.